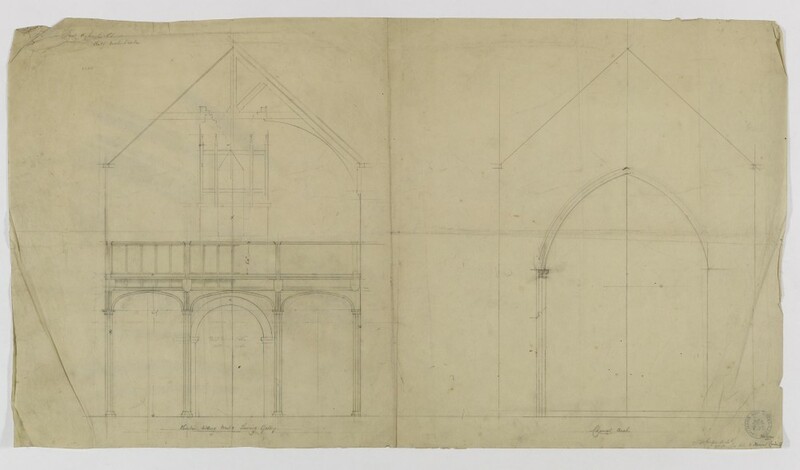 The letters and drawings are part of the J.N Comper Collection, RIBA Drawings & Archives, British Architectural Library. 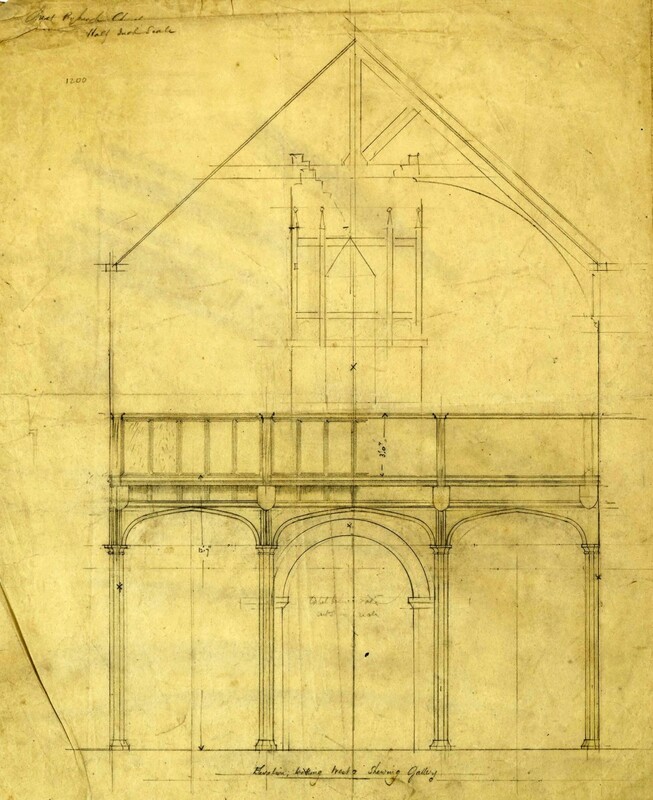 These are held in the RIBA Drawings & Archives Collection at the Victoria and Albert Museum. They are found in 13 boxes of uncatalogued correspondance 1906-1959. Boxes CoJ/101-103 were examined to reveal these contents There is also a folder of related drawings of which date details are included. 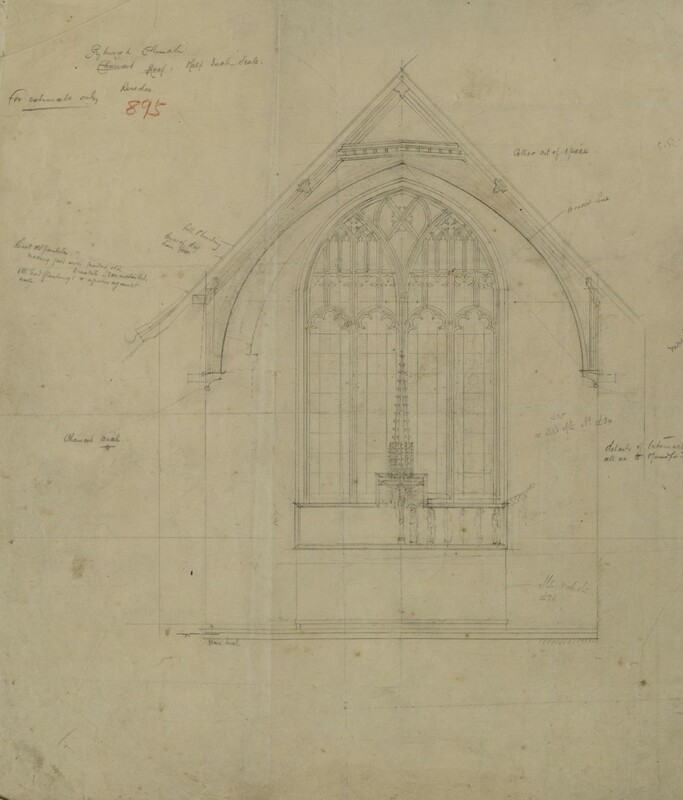 The images were supplied by the RIBA Drawings & Archives Collection at the Victoria and Albert Museum.,with permission to reproduce on this website Thanks are due to the curators who facilitated the visit to make these researches possible. Ernest T Jago from Comper’s studio visits Ryburgh probably to do initial “existings” and measurements. I am very glad to see your handwriting I began to fear you had gone abroad I am very sorry to hear that you have been seedy. What a pity we ever have anything to do with Chancellors. They should be treated with silent contempt in most cases though I believe in this Diocese things are alright and we have a reasonable one. It is most mysterious about your long letter to my mother, I trust when you have time you will manage to work up the matter again. I am glad you really think you will be able to come here at the end of this month. The trains you mention are alright and will not be changed. I know as I have a MGN timetable which is covered up to the 10th.of July. By this your train leaves Lowestoft 8.35, Yarmouth 9.15 arrives Fakenham 10.47 where I could meet you and the Great Ryburgh train leaves here at 3.51. I will inform Fisher and get him over. How are things going on? 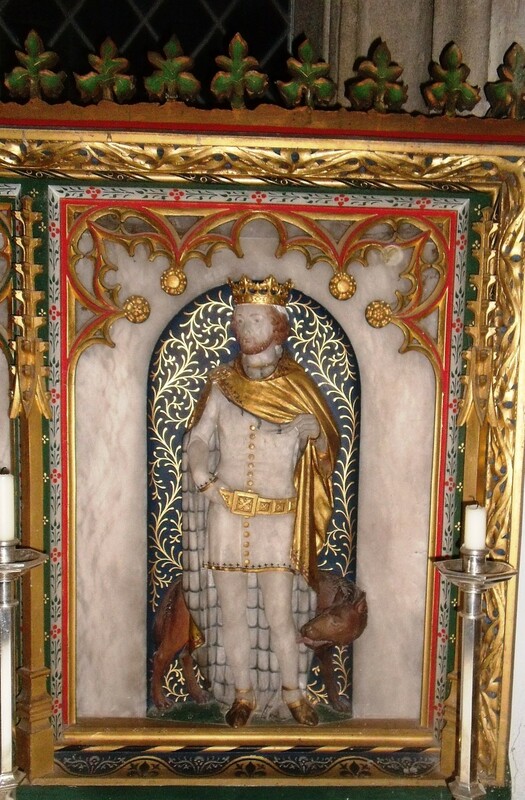 I had hoped by now to have heard from you but William of Cantley says never expect anything. The work on the outside, i.e. the trenching is practically completed and now I am very anxious to know how the plans for the interior are proceeding and how soon I could show them to the contractor to find out the probable total cost. I of course want if you can do so to have the whole plans, i.e. 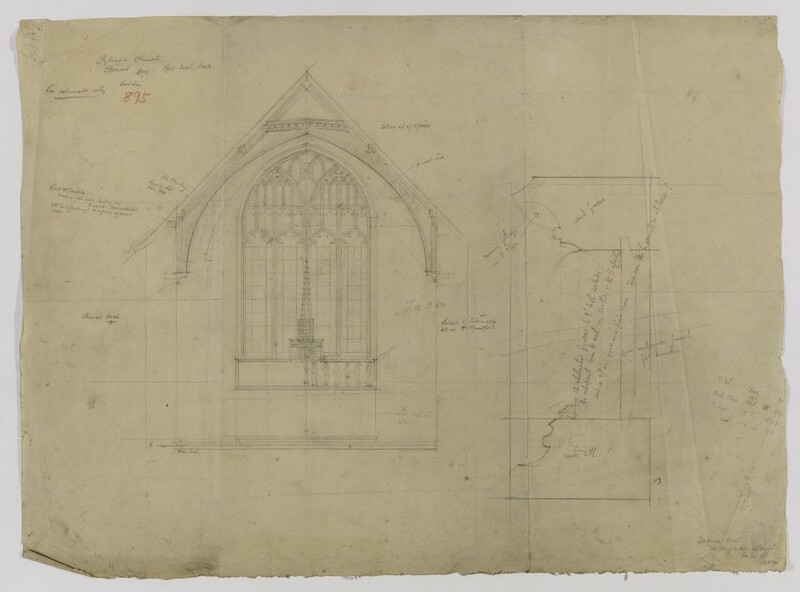 East window, Reredos, Altar, Chancel levels together with the tower staircase and gallery placed before the contractor or contractors and estimates got out to see what we can do chiefly because if we can do the whole thing it will simply be cheaper i.e. if we can do the lot then we might begin the gallery and so only have to move the organ once. Having moved it got the organ in place and then proceed to close Chancel and do that. I hear you have designed an Altarcloth which was too elaborate and which you felt so yourself. I hope however by now you have designed a simpler one so that my mother can get started on it as she so much desires to do it before all the long days of light are over. Please let me hear how things are going and of course whenever you or Mr Bucknall care to come down and see the Church again and talk matters over, please come only sending a P.C .or wire in advance to warn us. The design for the stone is beautiful and I quite approve. Good Shelter Penn Bucks July 10th. You wrote that you like best- I am still a little puzzled about the inscription as I am not a scholar & yet prefer Latin knowing that my husband chose it when he could- As far as I can read it I like the Latin inscription on No 3 but perhaps you have others to suggest.- The name would be George Edmund Tatham and the date of death Dec:25.1910 I am still longing for my work! – I go to Ryburgh on Friday next for a week. P.S. I have as you see my enclosed note the consent of our Vicar here & all my children have seen & approved the design. Miss Bucknall has put gold cord where I have marked without any? And it seems to me that it must therefore be carried on one side as far as the acorns in each corner. Then where the acorns have only a straight stalk it looks in the drawing as the cord were marked in one and not in the other. Will you kindly make this clear to me & return the drawing to Penn? I have taken notes for the leaves &c which I can work here. Good Shelter Penn July 23rd. Thank you for the drawing now quite clear for my work- also for your copy of the inscription. I enclose our Vicar’s criticism. I am wondering whether I had better have an English inscription as classical scholars seem to differ even as to spelling! 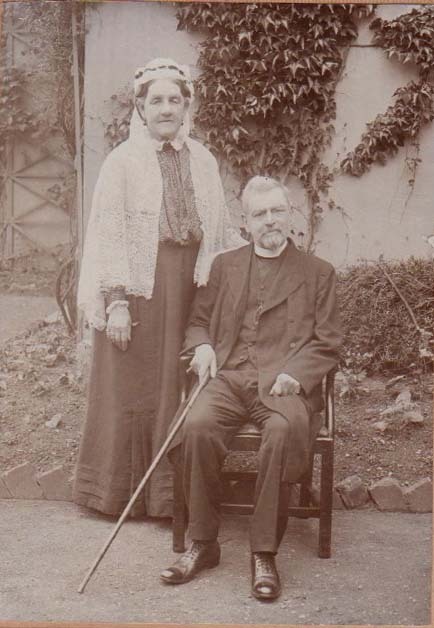 There is one mistake which must be rectified as altho’ my dear must husband was not 80 till Nov. 12.1910 still he died in the 80th year of his age- When Mr. Comper returns I daresay he will consider this again. V after M Mr. C. says, if is medieval latin, & it is more consistent to spell it in the medieval way- and even in our English of today we are as in the word”medieval” allowed to drop the dipthong! But if the other spelling is insisted on it is possible to get it in and would be less upsetting than now to have an English inscription. I ought to have written and acknowledged the drawings you sent me on the 15th. Inst but you see I am taking a leaf out of Mr Comper’s and your book and letting you wait!! 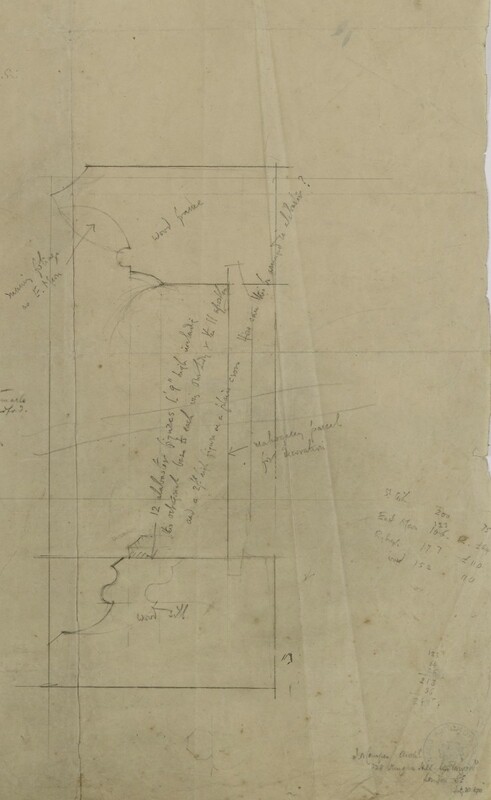 I have shown the plan of floor to Fisher and though he has given me at present no definite estimates, he has told me roughly what it will cost. Now how soon may I hope for plans of roof and East window? Once I get estimates for these I can begin on the work and the sooner the better before all the summer is gone so please therefore push on with the plans for if the estimates allow it I should then begin at once with the gallery. Once that is up then strip the roof and rebuild it if possible before the winter comes on. If you Mr Comper are down this way i.e. at Mundford or anywhere else, I should be glad to see you here to talk over with Mr Fisher the matter of heating as he has a suggestion to put before you and the only point will be the heating chambers etc. My mother has answered you re. inscription on stone for my father’s grave. I think as Mr. Spencer gives me carte blanche the inscription may now be considered as passed! I presume Mr. Comper undertakes with our local builder the fixing of the graves stone when it is ready- I shall be away from home all next month & hope to get on with my work. We can see now quite definitely that the original floor level was at least two feet below present as we have dug through this afternoon. Off to Bedford for a week tomorrow so if you want to write, address me C/O Major J.S Lightfoot Anchoret De Pary’s Avenue Bedford. This is the base of the monument, the bottom step is quite perfect and at one corner is just the suspicion of the next step. Two pieces of stone with red and blue painting showing were found amongst the East end rubble of course saved. They must be bits of the monument. The base is on red brick foundation about level with the old brick floor. Just a line to enclosed drawing and explanation sent by my wife this refers to the monument of which I sent you particulars. I suppose this base will have to be taken up now as the old brick floor referred to is not down to level of proposed new floor. 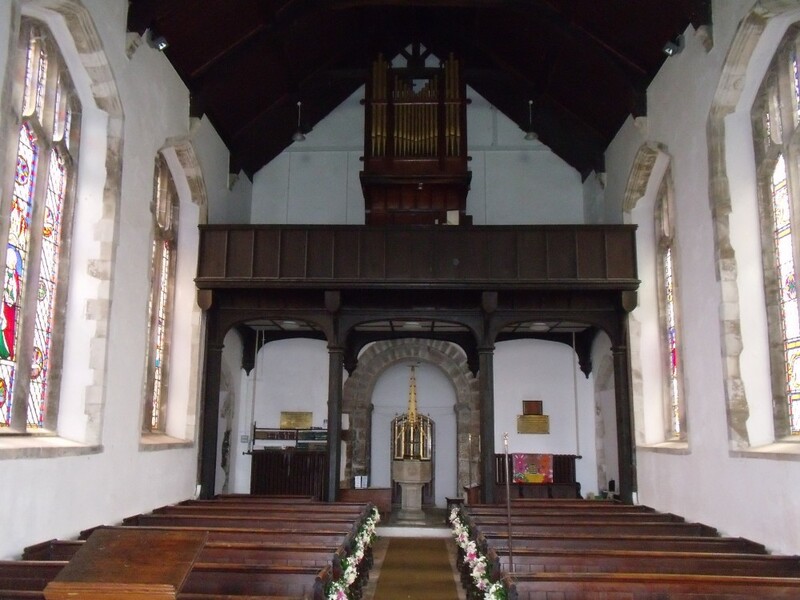 I have no reply from you as to discovery of original level of the Chancel which is lower than proposed new one. Friday can go home if I can get there and there is coal for the railway. I received Mr Jago’s* letter re heating apparatus dated April 23rd for which many thanks. Now I am getting anxious re Chancel on the question which begins to arise when will it be ready for opening as I have to do so much arranging so that all the family may be here. I have spoken to Fisher about it and he says that as far as he is concerned it can be ready if only he can have various things from you. 1 What about the floor? 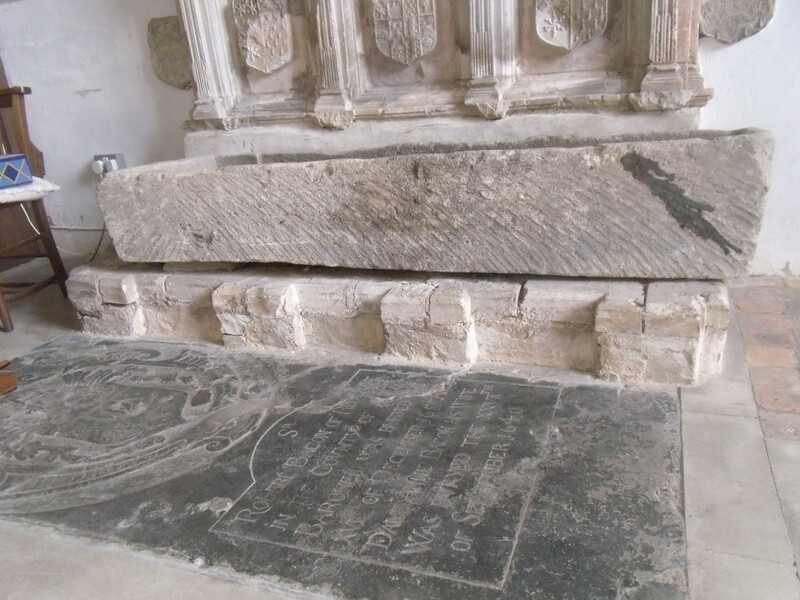 Is the piece of paving on the North side to be left as you said at first if so what is to be done for it is two and a half inches above the general level of the rest of the chancel. It seems simple to me for it would be alright as there is the base of the monument to the West of it giving a level of its own and therefore that might be better at a higher level with an edging to hold it and the communicant kneeler could be made to fit over the different level. 2. 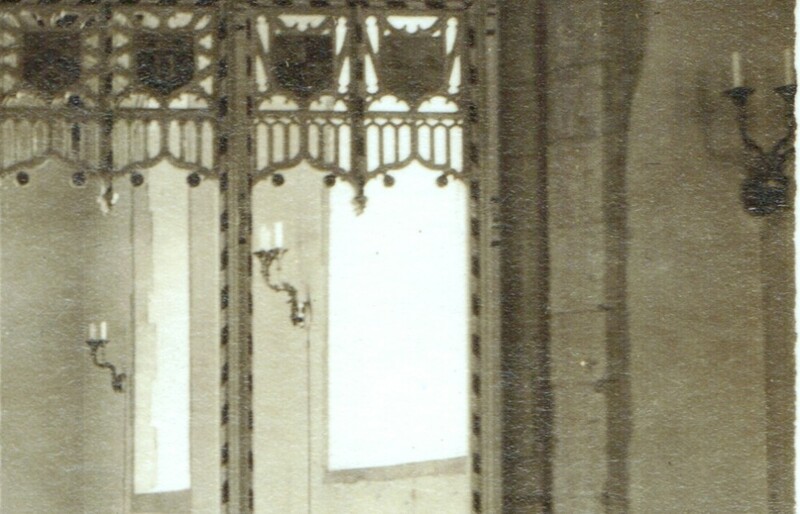 When may Fisher expect to have details of East window for which he is waiting? This could be got on with if only he had the detailed plans. 3. 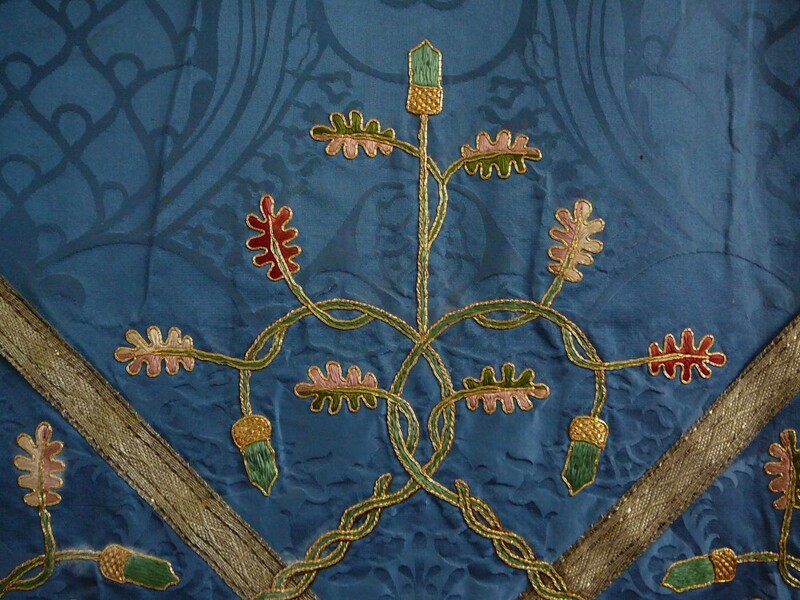 Have you given orders for the panels (fibre plasters) for Chancel and for the Angels? When will they be ready to put up? 4. 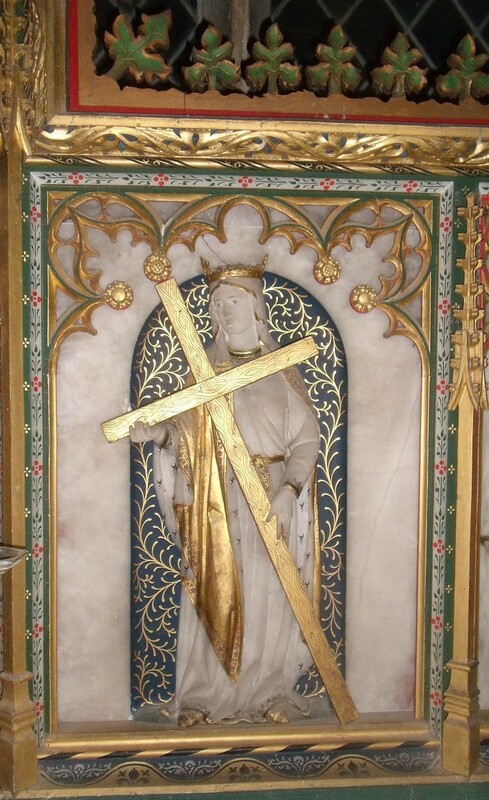 Have you given (as you promised) the order for Reredos and have they started doing it and when will it be ready? 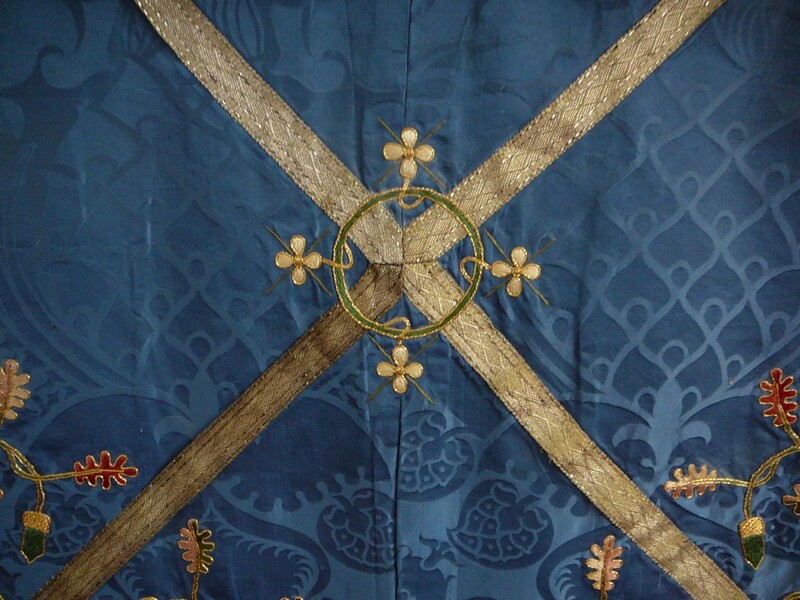 What we are working for is the Chancel to be re-opened about the last week in July or first in August. Fisher can do this if only you will answer all these questions and let him have details at once. I know you will think me a worse nuisance even than W.M. but remember my dear Mother is getting on in years and I do want her to see the work finished and also to be able to be here for the opening and it has been roughly arranged with her and the other members of the family that the opening should be at the time mentioned. 04 Nov 1910 / Ernest T. Jago / 10? Garfield? Rd, Lavender Hill / 05 Nov 1910 / "I will think of a remark sufficiently impressive, by next time". May 10th Good Shelter Penn. Bucks. Your letter arrived last night forwarded from Ryburgh so in a sense crossed my Postcard to you. 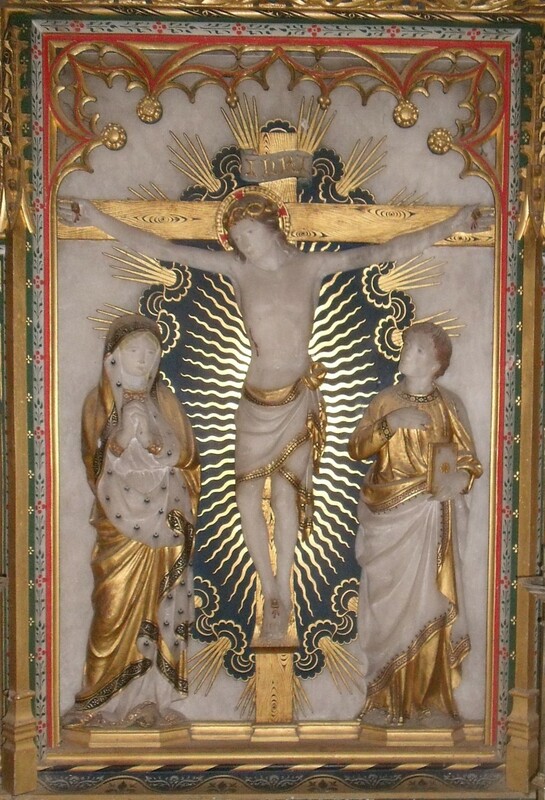 I am glad the Reredos is really ordered and that at any rate the carving work has begun. I sincerely trust the panels for roof will also soon be in hand and no delay will occur with them. 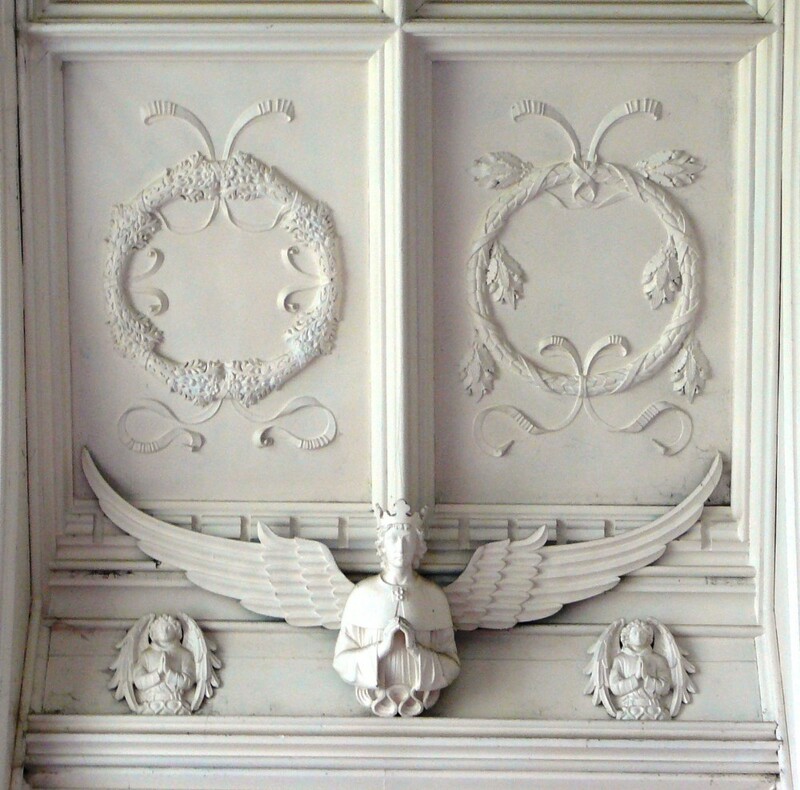 I thought they were designed ages ago and presume anyhow the Angel panels are as you told me that you had the moulds and had used them before. Don’t let the East window details slip your memory, we do so want to get on and have the openings as early as possible. We really should do our best to have them finished by August. 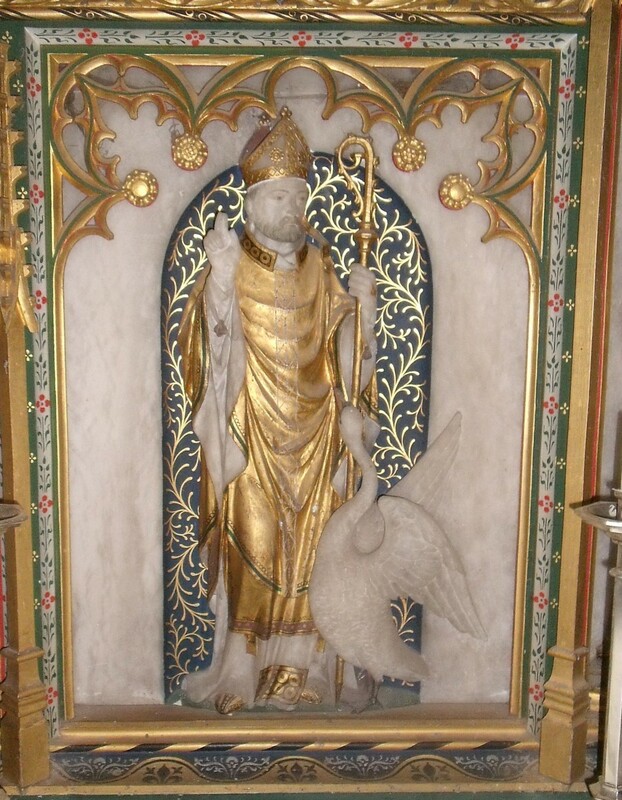 Now as to St Hugh, the face of on your card of course is far nicer and certainly I think that should be used but |I trust with Mitre and not a Cowl on. P.T.O how is Sebastian’s nose progressing and how is the Chauffeur and the Star. P.P.S. Who is to make the kneeling desks can you trust Fisher and have you got the design that won’t ruin me? Are you in England or where? Can I have an answer to my letter written a week ago? I am down here for a bit of rest although I have been seedy and collapsed last week and had to have duty taken last Sunday and shall have for two Sundays to come. Of course the worry caused by JNC is partly to blame. I am not fit enough to run up and see you or I would so at point of sword get answers to my queries. The direct Bacon, though very rich, Sir Heckmond Bacon of Lincolnshire who I have met refused to give anything. Kimberley and his son Lord Wodehouse have not had the decency to reply. When may we expect the “star” to turn up again with you and Mr Comper? Will any of you be coming down when we really get started on the Chancel? I shall watch the digging anxiously and had I not been seedy, should have been down there this afternoon. Enclosed the floor plan of the Chancel which Fisher has just brought back. He says the amended plan will be just the same price as the original for there is give and take in one or other. We have cleared the bottom of the monument of which I sent you the sketch (beautifully done yesterday) and we find there is nothing below the present floor level. So far nothing interesting has been found but of course we have not gone down far yet. 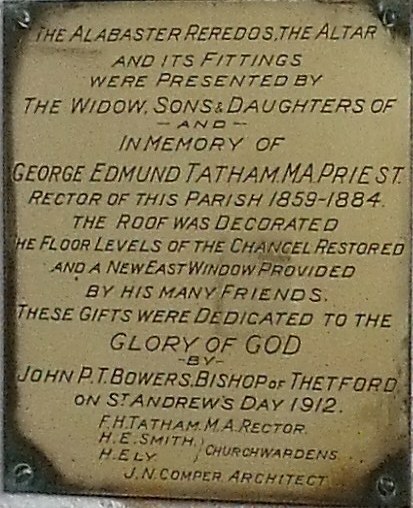 The monument has been covered over to preserve it from damage whilst the roof is done. 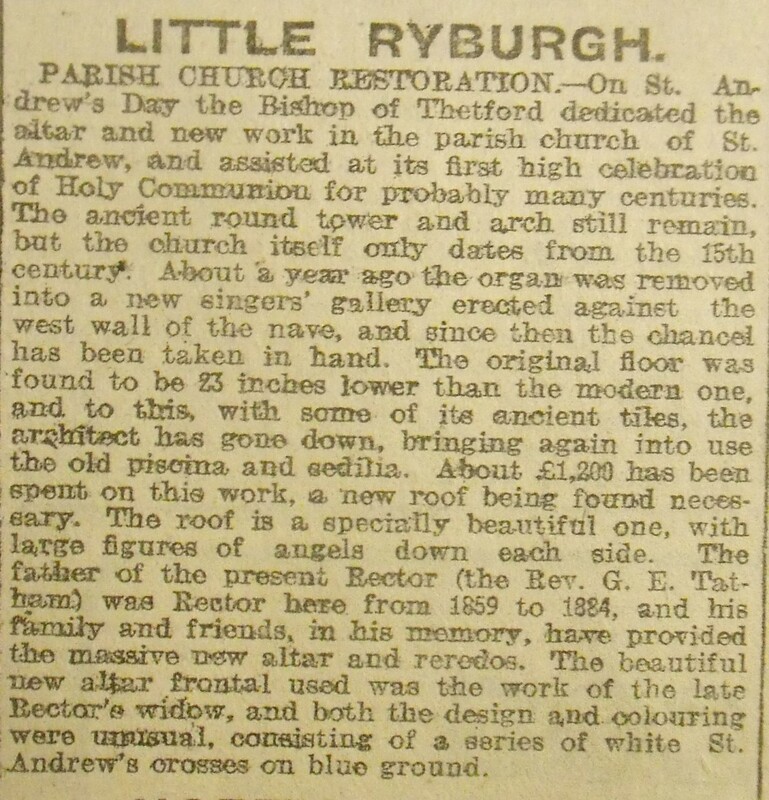 Nov 5th 1912 Ryburgh Rectory. Where are the chandeliers? Where is the frontal? We should be ready for Reredos by Monday. Anyhow it should be sent off now. I will send you word when men should be here to fix it. Don’t delay anything now that I tell you that the opening is fixed for 10.30 St Andrew’s Day Saturday November 30th. Will you be able to come? Will Mr A.B. (L……d) come too? Let me know at once so I can arrange about beds as I have nowhere. A Mother, 3 brothers, 2 sisters, 1 brother-in-law, 3 sisters-in-law and two of my boys home from school to provide beds for on Friday 29th. Night. Many thanks for yours. No news of Chandeliers this end yet. What a ghastly time they are about the Reredos and yet the frame and steeple? were absolutely finished ten weeks ago and the carving and poles? six weeks at least. You have not answered as to opening. Can you and Mr C come and will you come? If so when will you arrive we must know as soon as possible to arrange for as I said before I have about 15 already to arrange beds for Friday |November 29th and about 7 less on Saturday. 1 Is there a rod needed to support the frontal, if so what size and material should it be? I see there are supports in plan of Altar. How many such supports should there be? or how deep is frontal? PS I have just discovered this morning that the chandeliers are here. My silly idiot of a servant had taken the box in and put it away and never said a word about it to me. I don’t know who is responsible though I am most certainly not for this muddle about Reredos. I wired as I did to you this morning as yours was the only private address I knew, and thought you might know Gough’s private address and stop his men coming. I received a letter this morning from Gough saying the Reredos had left London on Friday and two of his men were coming to fix it and would arrive mid-day Monday. As the Altar is not fixed, they could do nothing so there was no use their coming. 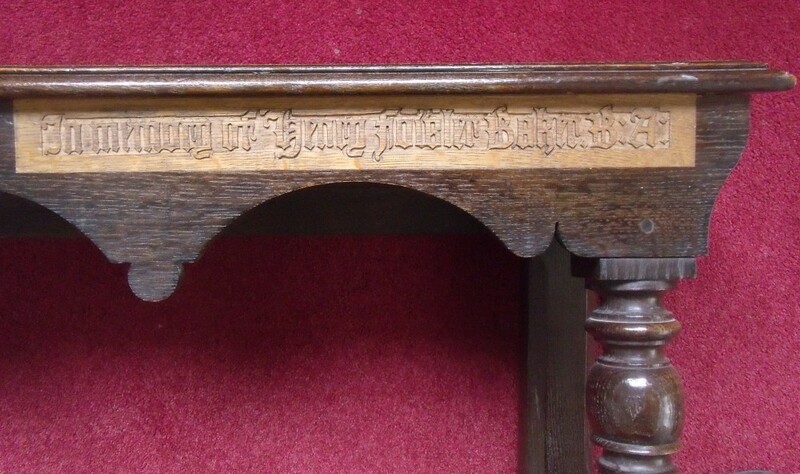 Why he said he was sending them I can not imagine and I wrote to you and Mr Bucknall and …..twice over that I would let you know directly we were ready for the men but to send on Reredos directly so that I could wire for men and not have to wait for Reredos. I hope you manage to stop them. I was and am still awfully sorry to have to wire on a Sunday but what was I to do? Now another thing please let me have an answer re November 30th. 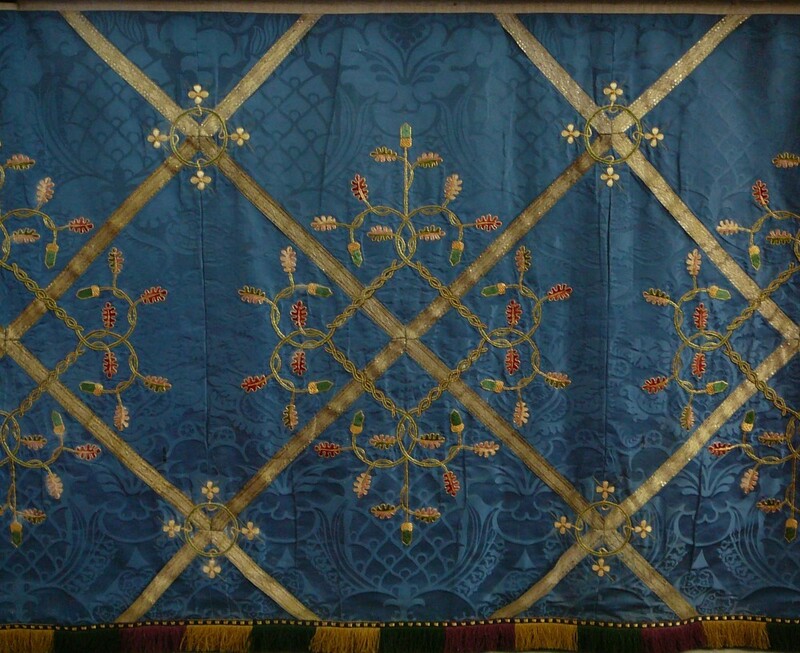 Also please send me patterns of blue linen of which hangings are to be and the blue Damask of Altar frontal if you can by return of post. I must just write a line to tell you that the Reredos is up in place, the Altar front finished and all but a few finishing touches done in the Chancel. The Reredos is lovely, far surpassing my expectations and the carving and colouring perfectly wonderful. Do you need criticism? There is only one thing I don’t like and that is the face of the Christus. I never have cared for a beardless Christ. The Frontal has also arrived safely though I am surprised it did for it came by goods train. The parcel showed evidence they were very frightened about it at first. The only blemish however is tarnishing of the silver braid. There is one other blemish but nothing to do with the carriage and that is there is no means of hanging it on the Altar. There are slots for the supports on altar to pass through to hold the rod. When you come down if you change your mind we still have a small room vacant on the 29th. I am too tired to write decently but felt I must send you a line. You mean man I am returning your supply patterns!! 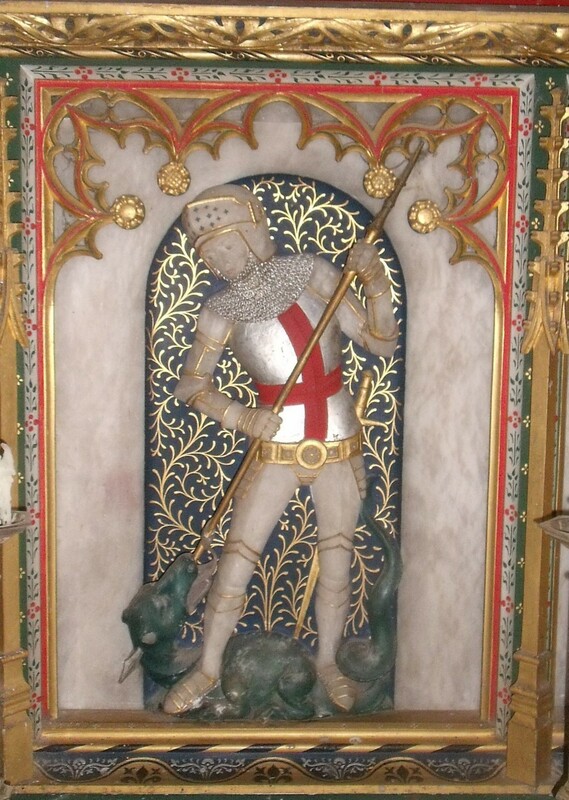 I am glad to hear that you and Mr Comper are still in the land of the living. I began to think the Suffragettes had potted you both. I was meaning to write to tell you how very much the Bishop of the Diocese was struck with the Reredos on his visit here especially with the Christus and so much so that he has written since and told me he had advised the Vicar of Wymondham to make enquiries from me as he is thinking of putting in a Reredos. So when the Vicar returns from his holidays he is coming to see me in the Church and I suppose I must advise him to come to you though perhaps I must warn him he might need expect nothing for a few years from you. Well now as to the gas bracket what on earth is there objectionable in the bracket sent. Surely it is simple quiet and insignificant and it doesn’t draw attention. Of course Mr Comper’s is quite out of the question, is it made of gold? 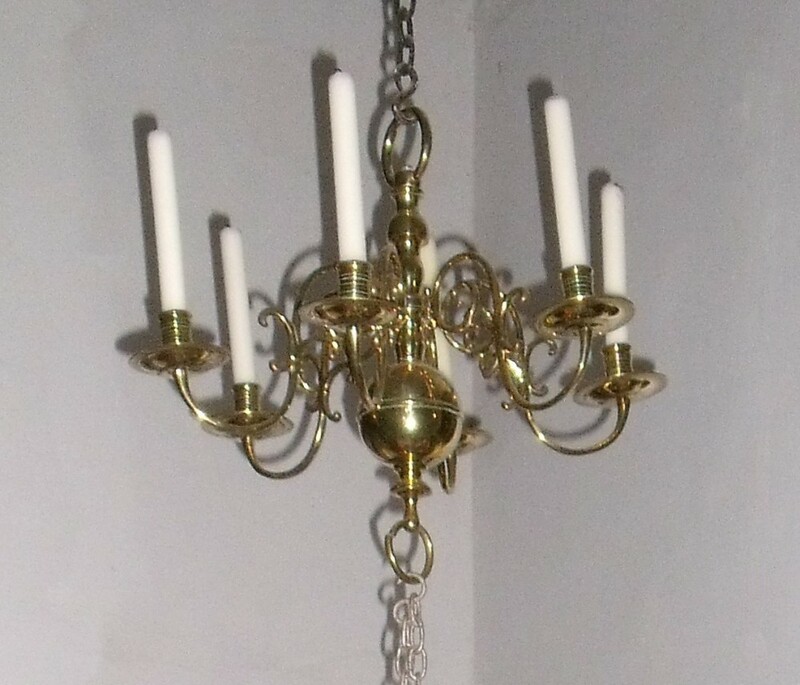 Why, the brass pendants from L Britain only cost £3-3-0d apiece. I say his are out of the question for this reason that the price of them would be with the standards for the gallery and the pendant for organ if on the same scale about double the cost of the whole installation. Whereas with the bracket I sent I could get the lighting in wonderfully reasonably. I should like to see the design and see what our people could make them for and also to know what metal they are to be made of. May 31st. 1913 Ryburgh Rectory. Sorry to have kept you so long waiting for address of Blacksmiths but I had lost it. It is E Allen, Blacksmiths Blakeney Norfolk. Candlesticks are about 6/6d each. The bracket I presume a brass one should be returned to me. Now to turn to the news at the end of your letter I had not heard a word after receipt of your letter I saw someone who told me that she’d heard and that you were very much enraptured etc. I congratulate you most heartily and wish you and your fiancée I don’t know her name every happiness. I can’t think how you and Mr Comper will get on now for certain. With you engaged and he always with his head full of other things I should think you’ll never get him up to time at all. Tell him I owe him a grudge, he never acknowledged that I got him Wymondham church and yet I was a good deal responsible. Where are you going to live? Kindest regards from all here to you and Mr Comper and not forgetting Sebastian. that we can still see and admire today, more than 100 years after it was made.